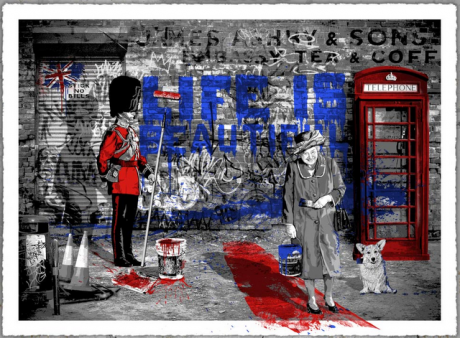 Today Mr Brainwash will be releasing his latest print, ‘Jubilation’… A mish-mash of all the london cliches thrown into one image, kind of makes me a little dizzy just looking at it. (Notice the Banksy rat behind the legs of the queens guard on the shutter). Well anyway, if you enjoy buying tat from the overpriced tourist trap shops that litter central london then this print will be right down your street,,,, Run of 150, available here today 12pm PST (limited to 75 prints online) for $350. The other 75 will be available when he comes to London. Personally im not a fan of Mr Brainwash or his ‘artwork’, leave your opinions below in the comments box.